4 days out - 4 days back - and the weather be damned! "Tired? I'll say! Mister, if you'd ever flown a 200-mile-per-hour cargo plane in from the Orient for the Air Service Command, even a corn-cob mattress would look as good to you as an elderdown Beauty-rest! He was only 22 years old, this Liberator Express pilot. He'd just brought his ship in - the end of a round-trip run on the longest air-freight haul in the world. From India, 14,000 miles away, to the Air Force Supply Headquarters at Patterson Field, outside Dayton, Ohio! Day in, day out, the huge, long-range Liberator Express transports roar down this Ohio runway and streak southward to Brazil's hump, then across to Africa, and on to the very fringe of Jap-held Burma. The boys who fly this shuttle run in Liberators - an all kinds of weather - call it the 8-day "Pony Express," - 4 days out, 4 days back. Each Liberator Express carries many tons of high-priority cargo - aircraft parts and supplies urgently needed by American airmen based halfway around the world. Magnetos, fuel pumps, jungle kits, propellers, starters, aircraft engines, radios, and other vital accessories. "It's a rugged run," the pilots say. 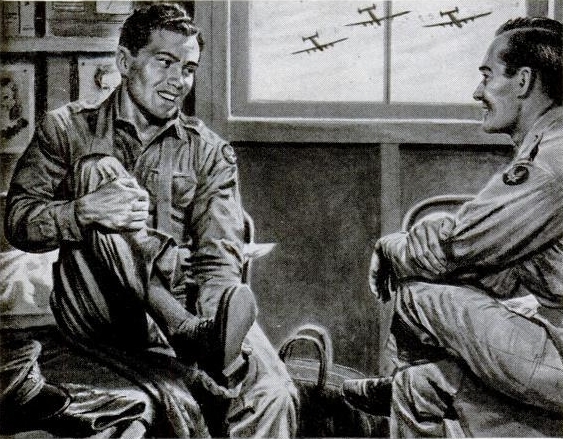 "But our combat flyers are doing a terrific job out there - and how they need the stuff we take 'em!" Dramatic as the India run is, it's only one of the ways in which we're solving the stupendous problem of supply for United States air bases the world over. 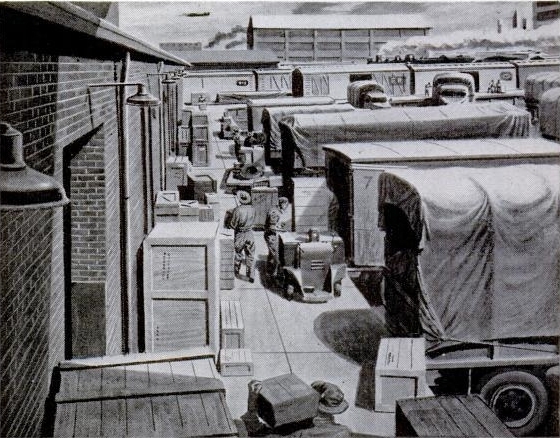 Every day, thousands of tons of parts and supplies are loaded into freight cars and trucks at huge Air Service Command warehouses scattered over the U.S.A. The furious tempo of Allied aerial warfare calls for miracles of transportation, not only by air, but over highway, by rail, and on the sea, as well. 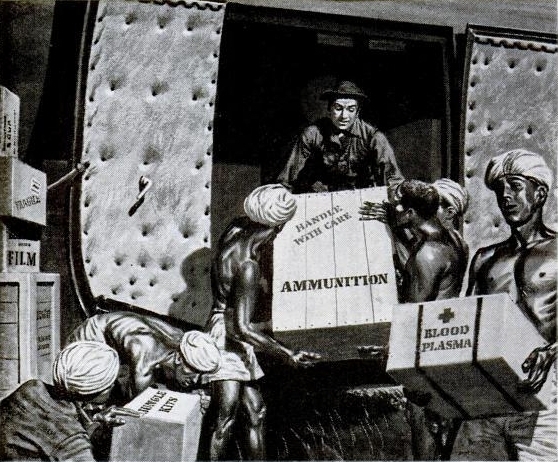 Boxes and crates, brought by truck and train, are lowered into the holds of waiting ships. 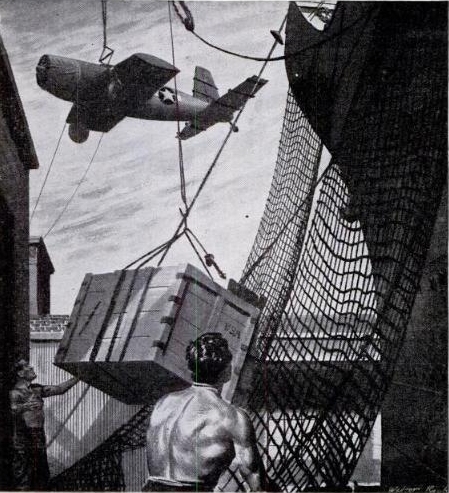 Often, part of the cargo consists of fighter planes which have been flown from factory to dock. Partly dismantled, they are lashed down on girder-like false decks for delivery overseas. Our constant and gigantic torrent of transoceanic shipping is truly a bridge of supply which is taking us closer and closer to Victory. The plane, the train, the truck, and the ship must team up together to help rebuild the peacetime world, just as they are working together to win the war. In fact, transportation will be a vital key to postwar peace and prosperity. But the plane will also have a second role to fulfill. 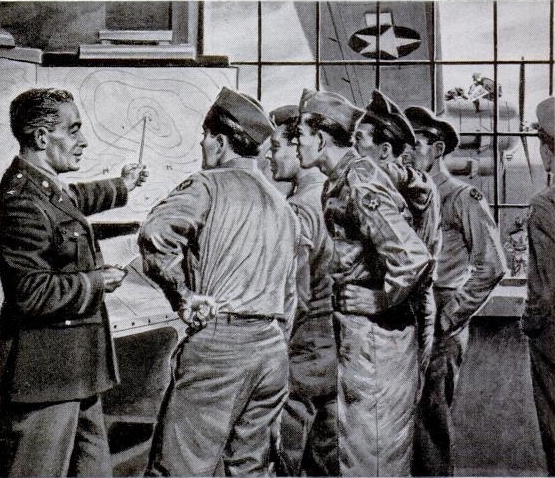 For the long reach and overwhelming might of American air power can well become this freedom-loving nation's most effective force for ensuring a lasting peace. 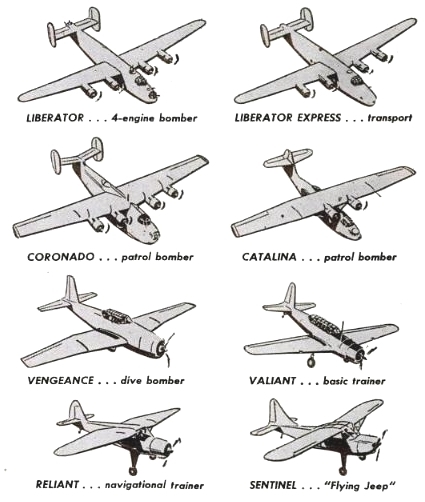 New role for the "Cat" - Although designed as a Navy patrol bomber, the Consolidated Vultee long-range Catalina flying boat is also being used as a transport, flying natural rubber out of South America. 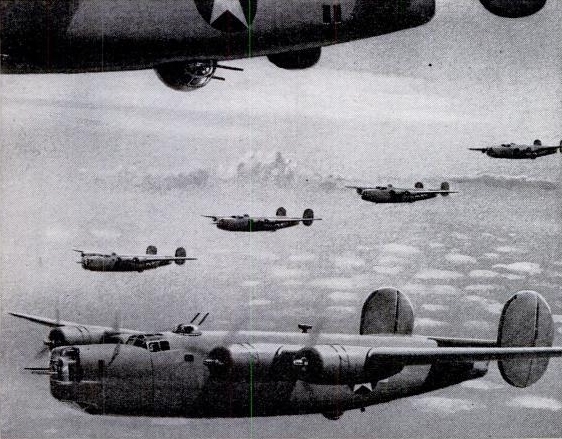 Now your War Bonds buy more Bombers - In the '43 fiscal year Consolidated Vultee has made savings of $251,000,000, which have been passed on to the government in voluntary cash refunds and price reductions and reserves for further refunds. This saving came about through new operating economies and efficient use of manpower, which enabled the company to turn out more planes for less money. North Atlantic Shuttle - It is reported that flights across the North Atlantic, in both directions, are now running more than 1000 a week. For Distinguished Service - Though operating with only about half their prewar equipment in '43, the airlines of America flew 37,639,000 ton-miles of mail (a gain of 78%) . . . 15,774,000 ton-miles of express (a gain of 34%) . . . 1,540,000,000 passenger miles (a gain of 10%). Advertisement adapted by Carl W. Weidenburner from the April 10, 1944 issue of LIFE magazine.